Quick note: We somehow made it through the hurricane without losing power, but we have relatives up in NY and NJ who didn’t fare as well. Our thoughts are with everyone dealing with the after-effects of Sandy. Stay safe everyone! It’s Tuesday the 30th… so it’s time to share this season’s (completely unofficial) Pinterest Challenge project (not sponsored by Pinterest or anyone else, just dreamed up by Katie to make us stop pinning and start doing). Huzzah! 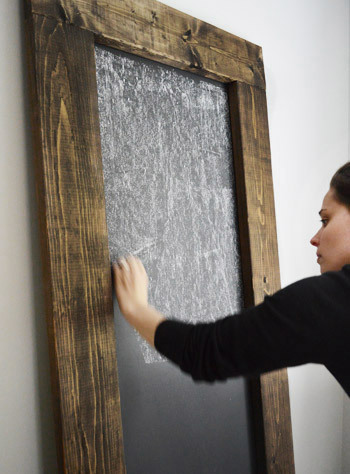 This time John and I tried our hand at making a large chunky-framed leaning mirror – except instead of it actually being a mirror we made it into a giant chalkboard (since chalkboard paint is probably the most Pinterest-tastic material out there, haha). By designing it like a large leaning mirror, it can move from room to room, and it can be a place where we write sweet notes, make lists, and enjoy Clara-scribble (we secured it to the wall with leaning mirror hardware so it’s kid-safe – more on that method here). And here’s how we tackled our own version. The cool thing is that we were able to use a big board of plywood that we already had leftover from building in the fridge back in November of last year (yes, it was just chilling in our basement since then). But before we got to the chalkboard paint application, we rolled on some magnetic paint (since we already had a quart of that from this project in our first house). Sorry this isn’t a full shot of the plywood board, but it’s 68″ tall and 21″ wide if that helps. After a four coats of magnetic paint (we wanted it to be pretty strong) it was time to add the chalkboard paint. So we grabbed this can from Home Depot for ten bucks and we rolled on two coats of it. We only applied it to the front side of the board, but you can see from this pic that we actually had some fun with the back side too, but we’ll get to that in a second. As for building this whole shebang, we set out to make it without the need of any fancy saws or tools. 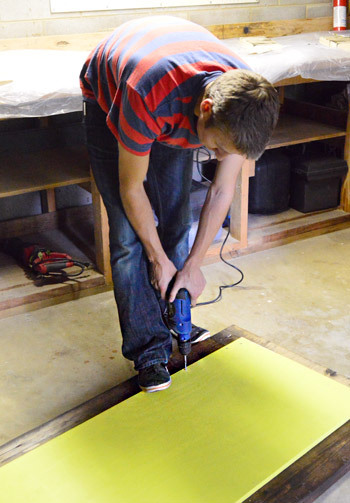 And because Home Depot is happy to cut plywood to size for you to make the board, and you can also get them to cut a few 1″ x 6″ boards to create the frame… this project calls for no cuts at home at all. Woot! For our 68″ x 21″ piece of plywood we got two 29.5″ 1 x 6″ boards for the top and bottom of the frame, and two 63″ pieces for the sides. 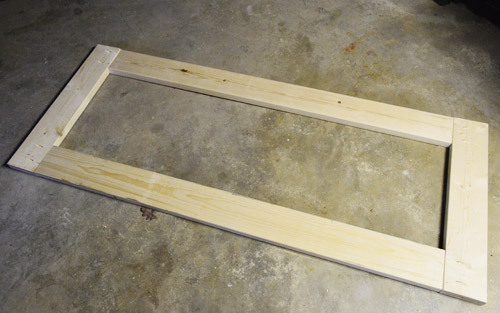 This allows for a little bit of overlap when the frame is assembled so the board looks as if it sits inside the frame (but really rests behind it). 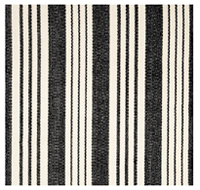 The total height and width of the entire finished project is 29.5″ wide by 74″ tall. As for the stain, we went with our old favorite (leftover from a bunch of other projects) which is Minwax in Dark Walnut. We stained the wood before we assembled the frame because it seemed easier not to have to worry about getting stain on the chalkboard part of the board. After the frame was all stained and dried, we just used our Kreg Jig to attach them (but if you don’t have one you could easily use metal brackets to hold them together from behind or just try to screw them together from behind without a jig). Bam. A dark walnut frame. Without a miter saw, angle calculations, or anything else that could get complicated. Then we attached the chalkboard part to the frame from behind. And… surprise! John got a wild hair and painted the back in Citron (a leftover pot of BM paint that we had), just because he said the bare beat-up back was bugging him. Sure, we’ll probably only see it once every few years when we carry it around the house (you know we like to move things around) but I love that man for adding that secret plane of color just because he knows it’s there. Haha. 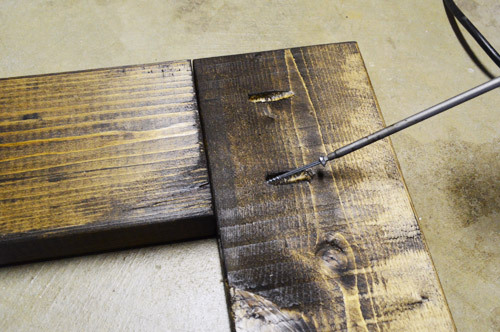 Oh and to be clear about how you attach the chalkboard part to the frame, you just screw around the edge of the chalkboard from behind because it overlaps the frame slightly, so as long as your screws are long enough to go through the plywood and into the stained frame (without poking all the way through the front) you’re golden. I think the length we used for those screws was an inch and a quarter. Then we just let it air out/cure for a while (chalkboard paint + stain are both stiiinky until they fully cure) and it was finally time to bring it up into the living room along the wall where we wanted to lean it. Then we just secured it to keep it from tipping over (using the same dealio that we used here). Don’t want it bonking the bean! Next it was time to “condition” it by rubbing the side of a piece of chalk all over it and then wiping it all off. Boom. Conditioned. … let’s just say she got pretty darn excited. Haha. It must be a mom thing, but I totally think my kid’s scribbles are THE BEST. I mean, have you ever seen anything so beautiful? Don’t forget to check in on Katie, Carmel, and Sarah to see what awesomesauce projects they’ve whipped up (they’ll all be sharing theirs sometime today as well)! we’d also love if you could quickly link back over to our project posts within your own (here’s Katie’s, Carmel’s and Sarah’s) – it’s also nice to link to your inspiration project on Pinterest as well as to directly link to the original project/site, just so they get some love too. And if you’d rather just link over to your project in the comment section, feel free to do that – or even add a link to a free photo sharing site like Flickr with your pics if you don’t have a blog (remember to set the gallery to public so we can all see it). 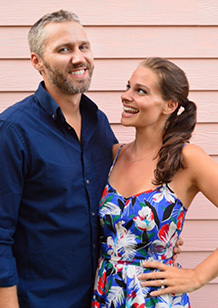 We’re crazypants excited to see what you guys have been up to! Love it! Clara looks very happy. 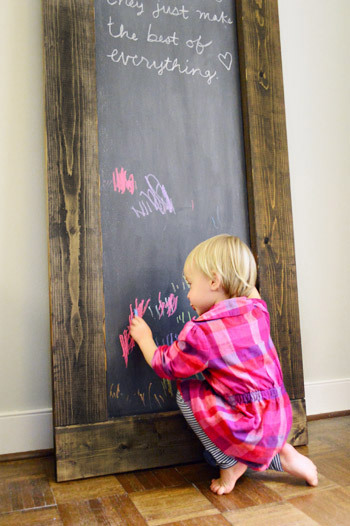 Plus, when she grows out of the coloring stage, this chalk board is nice enough to use in your kitchen or laundry room for a to-do list or grocery list! What a cool chalkboard! I love the scale! Thanks for hosting – I look forward to the pinterest challenge every time! So fun! Glad to be linking up for my first Pinterest Challenge-thanks for the encouragement! Oh, and that chalkboard? Totally drooling! I ordered fabric for mine (the plush magnetic letters from http://www.apartmenttherapy.com/how-to-make-plush-alphabet-magnets-chez-beeper-bebe-165414) that didn’t come in until yesterday, but I Instagrammed a photo of the work in progress! I want to blog the whole thing when it’s done. I love the new chalkboard! Is it just me, or has Clara grown a few inches overnight? Thanks again to YHL and the Pinterest Challenge crew for getting us all inspired and motivated to tackle new projects. As always, it was a blast! Aw thanks Wendy! We love doing this with you guys each season! And yes, Clara is growing like crazy these days! Thanks for hosting this fab Pinterest party! 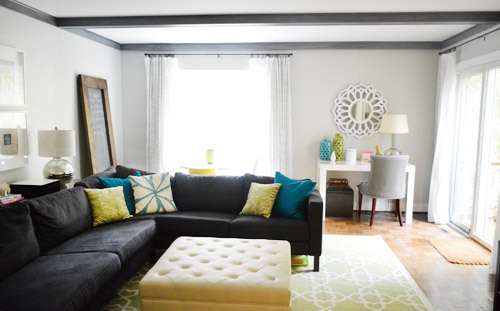 I love how you guys are balancing making a living room fun for a pre-schooler with making a living room look great. 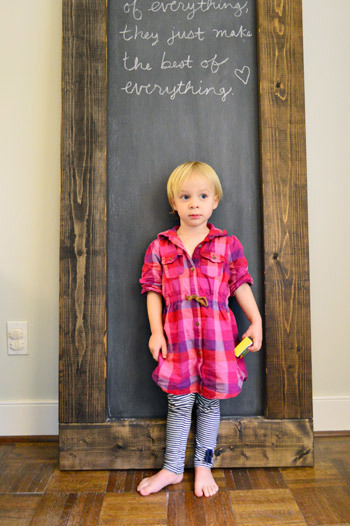 Love the chalkboard, and kind of want one for myself! My first Pinterest project failed, and then my second tried to kill me…Ah well. On a more serious note, I’m glad you guys are well and am keeping a good thought for all the people impacted by Sandy. Love the chalkboard. I think you will enjoy it for a long time! Clara looks like she loves it! What a great place to start learning letters and numbers! 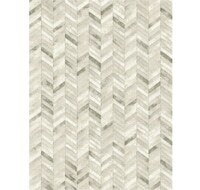 And I love how it brings the dark natural wood tones from your ceiling beams down to eye level! I made faux pinch pleat curtains ala House of Hepworths. They turned out amazingly! Love all the links guys! Everything looks great! That turned out so awesome. I am LOVING that chunky wood frame (in our favorite stain, too!). You know our big chalkboard gets tons of use around here. Daily! It hangs out in my studio now as Greta’s blank canvas when I’m working, but for our costume party over the weekend, I brought it downstairs and all of the kids covered that thing three times over. Chalkboards=the best!! This is a great project. I’ll probably be building one of these myself in the next couple years. 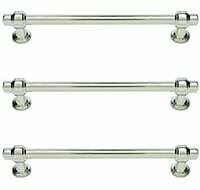 More proof that pocket screws make the world go round. We might take a drive up to NJ on Friday to your book signing! We’ll see how the roads and bridges are. We still have power in SJ. I am thinking there has to be SOME use for the flip side with the pretty color John painted! Like..using it as a backdrop to stick up some pictures of Clara at her next birthday? It could even be laid across two benches and used as a table! I’m so bummed – we lost power and had to hunker down so I didn’t get to finish up my project, pictures and post. Are you extending the entry time due to Hurricane Sandy? P.S. Glad you guys are safe….it is still circling over top of us so more high winds are expected. Love this! 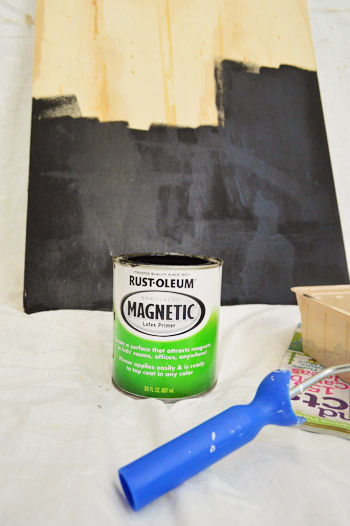 When it comes to chalkboard paint – the bigger the better! Hah! Wait?!?! Did Katie have her baby?!?!?! haha ok :) Just a bit too excited. Yes, being “full of baby” will definitely slow things down. P.S. LOVE the chalkboard. I had my husband make these for our seating arrangements at our wedding. It was a fun and easy way to do things a bit differently. Ours warped over time though :( boo…I hope the same thing doesn’t happen for you guys! I love the look of it in the living room! Ooh I can see next year’s birthday pics being taken here. What a cute way to write what she is loving at the moment and what age she is. LOVE IT. Seriously. This is such a fun idea! I have a corner in our living room that I’d been saving for a ladder to hold throw pillows, but this just might be better! 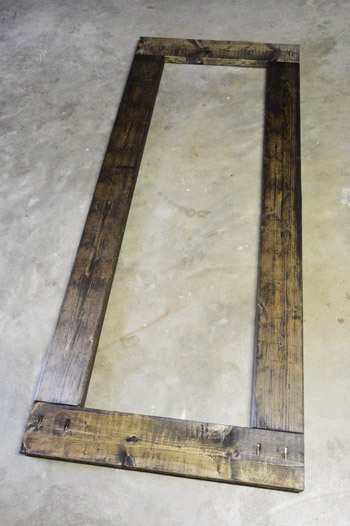 DIYDiva did one that looks almost the same but she made it from old barn wood from her farm! Love that too. So glad that you all made it through the storm ok. On her way to school this morning, Riley said, “Momma, I hope that Clara and her Mommy and Daddy and doggy are ok. I told her that I was sure that you all were fine and that it was nice of her to think about you. We prayed last night for you all and for everyone we knew on the East Coast. 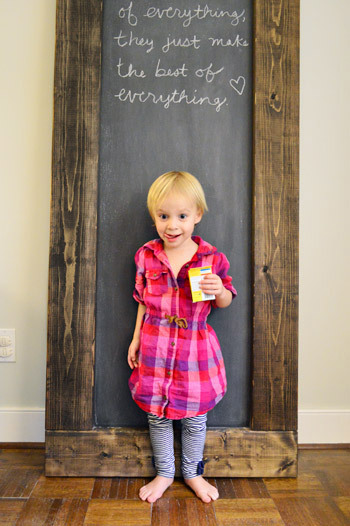 Love your chalkboard and the video of Clara!! She is too funny!! P.S. I don’t know why that video I put on Facebook of Riley saying Hi to Clara wouldn’t work. I might have to try again. 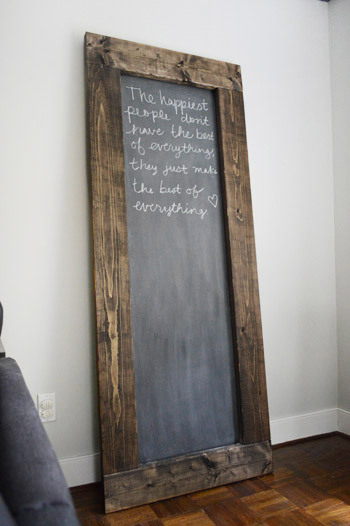 Love this rustic chalkboard! It’s looks perfect in the room and it seems like Clara’s found a new favorite activity! Gorgeous! I love the way the chalk board turned out. Love that wood! I love this! You’ve totally made me want to make one of these for our rented flat… I’ve got just the place for it, too. Hmm. Brain ticking! I apparently can’t link up at work so I will have to wait till I get home to share my bookcase makeover….drats. I absolutely love this! The finish y’all chose looks so good. When I first saw it, I thought you’d found a huge old frame to fill. This will make a fun menu board/sign at a party too! I can’t see the video – anyone else having that problem? There is just a big blank space…Thanks! Sometimes on a smart phone that happens. So sorry! What a simple but great project! I just did a food pin – again! Noooo I can’t write right now……..haha!! Too cute. “No, I can’t… I can’t try it right now” There’s simply NO TIME!! :) So cute. Love all the links everyone! Thanks for sharing! Love it! The chunky wood is the best part! Looks amazing guys! Love the “finished” yellow backing, just because you know it’s there, haha. We love these Pinterest Challenges! 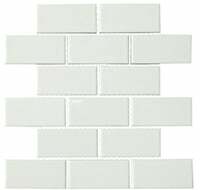 I was thinking maybe you would put this in the black side of the frig wall–but you probably have something else dreamed for that space! but I can see it when I go to the blog through Facebook! weird computer stuff…oh well! Thanks again. LOVE how this turned out, and what it does for the living room! Great job! Clara looks like such a big girl next to the chalk baord! So cute! Looks great! 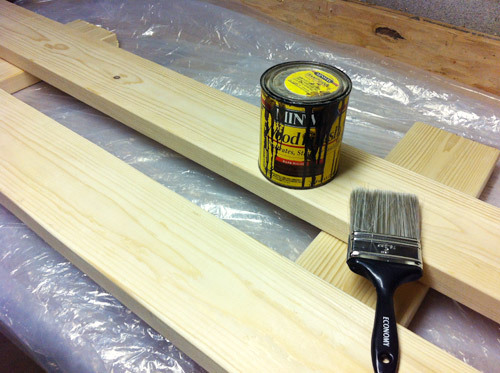 I know that yours is rustic and specifically matched to your console, so this tip doesn’t really apply to this project, but, should you ever want to get a really even coat of stain with less variation of light/dark, you can water pop the wood first. We did it to our wood floors, which gave us a nice even darkness but still kept the wood grain nice and visible. 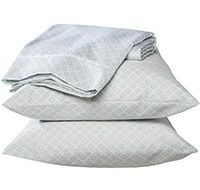 Just sand as you normally would, and then rub it down with a wet washcloth. This raises the grain again so it will absorb the color evenly. You will be convinced that you ruined all your hard work from sanding, but just keep the faith. You can read more online about it if you’re curious. This is so fun!! Bonus – I love the way it looks in the space! 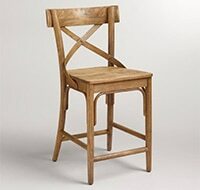 I’m in love with a Dark walnut stain, rustic and elegant at the same time. Your chalkboard looks great! I’ve also been browsing everyone’s links, and there are so many amazing projects I want to try there. And I have so much more browsing to do! 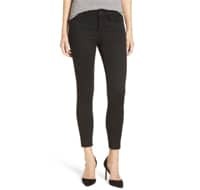 Pinterst-challenge-reveal day is definitely not a day for getting work done. And I have to say, my reaction from that first pic was you can put that cutie beside just about anything and it will look awesome. Clara is so lively and adorable! Oh my goodness, the look on Clara’s face when John said, “I thought Clara started with a C” is priceless! Thanks so much for hosting! Your chalkboard is super awesome! Okay, I am officially doing that. I love that so much. How cute would that be in a little boy’s rustic room too? Love it! This is fantastic. I really love it! this is great! 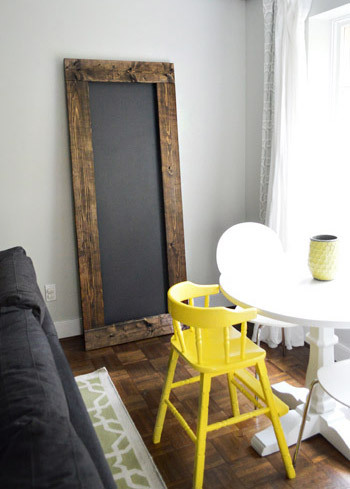 do you have suggestions about making this into a mirror instead of a chalkboard? I have been eyeing the huge leaning mirrors at Ikea but at $120 a pop, I’m reluctant! Maybe you can frame out a cheap mirror like they do on Pinterest? I’m with you – I think my daughter’s pictures are the best. Last year for Christmas my husband set her up with watercolors and watercolor paper and the painting that resulted looks like a landscape at sunset to me. And this weekend she caught be completely off guard and wrote her name! Ok, I’ve thought about doing this because my kids love playing with chalk outside, but how do you deal with the dust?? Dust in the house, and on hands? The chalk that you use outside seems to get ALL over their hands, clothes, etc. and I worry about that happening inside too. 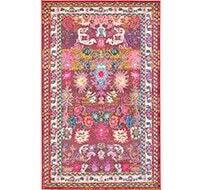 Getting on furniture, rugs, etc. Clara has only used it a few times so far but it’s just like markers or play doh (we wash hands after and I wipe down the board with a damp cloth – just like I wipe down the table after play doh). 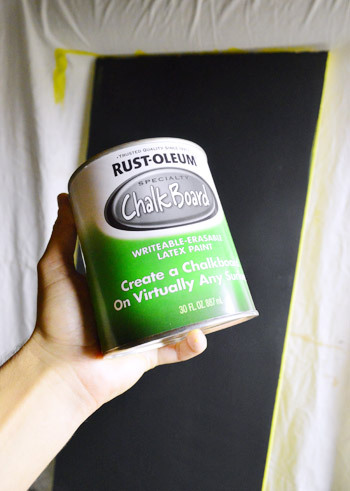 I use chalk markers on my chalkboard- no dust! More expensive than chalk, but I love them- no dust and mess!